Use our deal for cheap Blue Man Group tickets and save $17 per ticket on Category C seating and $37 on Category A seating for the Luxor in Las Vegas. These tickets are from an authorized source for discount Blue Man Group tickets, bluemanticketing.com. Click on Coupon Puppet below to visit their site now! Blue Man Group is one of the most classic shows playing in Las Vegas. It has been around since the year 2000. It started off at the Luxor, moved around a bit (most recently to the Monte Carlo), but now it is back at the Luxor where it all started, with a theater especially renovated just for them! Why is Blue Man Group so great? First off, it is family friendly and for all ages- children 3 and up are welcome. Secondly, it is perfect for foreign visitors- there are absolutely no words in the show. Plenty of noise and music, but no utterances that might be considered English. You can attend a Blue Man Group performance seven nights a week at 7PM or 9:30. They even have the occasional 4PM matinee. Which is hopefully when those three-year-olds would be attending. There are lots of sites that claim to have cheap Blue Man Group tickets on the Internets. But you don’t want to go buying tickets from an unverified source. Bluemanticketing.com is authorized by Blue Man Group to sell discount Blue Man Group tickets. This specific deal is good on any performance, for seating areas A and C. A seats are normally $136.40, but with this deal you pay $98.78. C seats are discounted from $97.89 to $80.52. A and C cover the majority of the theater. The only sections not covered are the poncho zone right in front and a few rows in back. 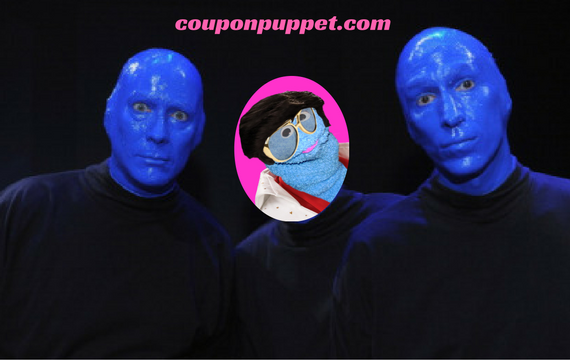 Coupon Puppet Loves Saving You Money On Cheap Blue Man Group Tickets!